On May 8th. 1974 a meeting was held with a view to establish a male voice choir. Those present were Mrs. Pam Jones, Ivor Jones, Alec Ayling, Tom Harding, Paul Scott, J. Bradshaw and D. Newton. The first practice was held on September 10th and 18 members attended. By January 1975 there were 31 members. The Choir’s first major concert was held at the Exmouth Pavilion on July 13th to a packed house. This was the birth of the heritage that is the Budleigh Salterton Male Voice Choir. For the past 40 years the Choir has been performing regularly, raising large amounts of money for local and national charities. For 18 years Pam Jones was the Choir’s musical director and when she retired, she graciously consented to become our President, a post she still holds. Single handed she steered the Choir to a high standard, winning many awards along the way. During the past forty years the Choir has experienced many changes, in style of music, in membership and in the method of presentation. There are few choirs that can give a concert without the use of sheet music. Our repertoire includes classical items such as Welsh Hymns, spirituals, folk music, music from the shows, opera, acapella and popular songs. We try to cater for all tastes. From 1997 to 2013 the choir was under the direction of Allen Coles who continued the choir’s development and helped establish our reputation of producing professional concerts with quality guest artists. Val Howels is one of our regular soloists and has been singing with the choir for 21 years. The contribution of people like Pam, Allen and Val has ensured that Budleigh Salterton Male Voice Choir will be around for another forty years. 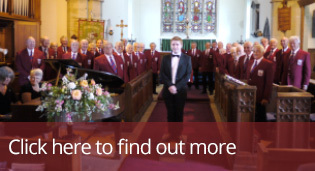 Over the years, the Choir has performed at many venues both within and outside of Devon. These include Exeter Cathedral, The Great Hall of Exeter University, Cardiff Arms Park, Dartmouth Royal Naval College, St David’s Hall, Cardiff, Truro, Holland, and Yorkshire. No choir is static and we are always on the lookout for new members to join us. Prospective choristers are not required to undertake an audition or to read music, but the ability to sing in tune is rather important! We seek team players, not operatic virtuosos, but we like all members to play an active part in the Choir’s public performances throughout the year. Practices are held every Tuesday at 7.30p.m. at the Peter Hall in Budleigh Salterton. If you are interested in joining a friendly choir and singing in aid of charitable causes, please come along to meet us one Tuesday evening - click here to find out more.